A few words on Dave Roe. He played bass with Johnny Cash for 12+ years. I saw him play 4 shows with Johnny & June. Then it ended up that he contributed backing vocals and some bass tracks to both of our records. He also played a few shows with us. Here we are rocking at the Lava Lounge in 2004. He and Mitch Marine had just gotten off stage after performing with Keith Richards, Norah Jones, Lucinda Williams, Steve Earle, Jim James, Dwight Yoakam etc. 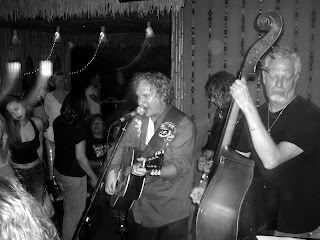 at the Gram Parsons Tribute at the Universal Amphitheatre and drove straight to the Lava Lounge to jam with us. Here he is playing bass and singing back-up vocals on the song Old & Gray from the Wet Dog Man album. Here he is playing with Johnny Cash and Marty Stuart!